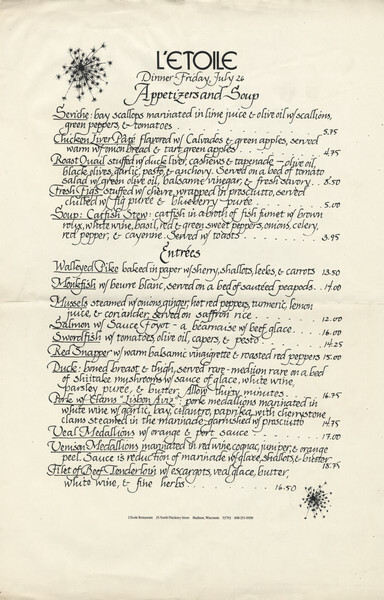 One-page dinner menu from L'Etoile Restaurant, with menu selections in calligraphy and the restaurant's starburst logo at the top and bottom opposing corners. Original loaned for scanning. For other menus from L'Etoile Restaurant, see also Image IDs: 103786, 103788, 103789, 103791, 104540, 107411-107413, 107415-107416, 107418-107421, 107425-107426, 107528, 108572, 108576, and 108921.